During the autumn term pupils at six local Primary and Junior Schools were hard at work, supervised by their teachers, making art work for this year's Stormont Awards. The 2018 theme was JUNGLE and the art work was to be two-dimensional. We received a wonderful variety of colourful scenes where the children showed great creativity and imagination. Rye Community Primary School, St Michael's CE Primary School Playden, Peasmarsh CE Primary School, Beckley CE Primary School, Northiam Primary School and the junior classes at Rye College. 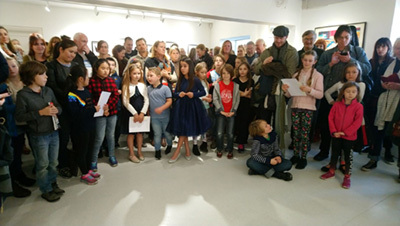 The Gallery enjoyed hosting an excited crowd of teachers, parents and children on Saturday 3rd November for the Awards ceremony and opening of the exhibition of the 150 entries. The winners, runners up, and winning schools received wonderful prizes, enabling them to invest in quality art materials. Highly commended works were also given art prizes. Celebrated artist Richard Adams presented the awards and made a very valid point to the participants - "Don't dismiss a career in Art, it is possible and it can be incredibly rewarding doing something you love all day and looking forward to work the next day." 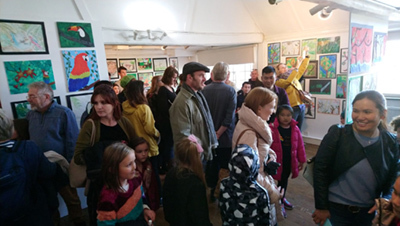 Organiser and trustee, Kate Van Der Pump, a former art teacher, believes that offering practical resources with easy schools' access will benefit everyone. 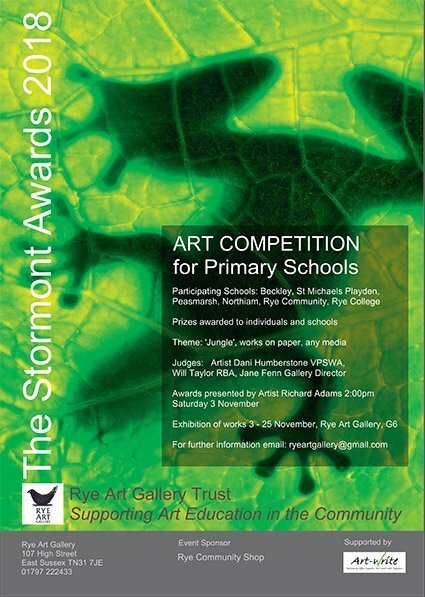 The Stormont Awards, set up by the Gallery in 2017 following an idea by Michael Miller, former Chair of Trustees, are in response to growing concern that children are experiencing less creative art time within the constraints of today's school curriculum. The entries were exhibited in the Studio Gallery 6 at the top of the building. The Rye Art Gallery Trust is most grateful to Rye Community Shop for awarding us the resources to organise this valuable and creative competition for the children of Rye and surrounding villages. Special thanks to Kate Sims and her Board of Trustees. For the second year running, Nick Moon at Art-Write, our local store for a wide range of art materials and office supplies, donated a special prize and he chose the winning entry for his Award. Do please support these Rye philanthropists!